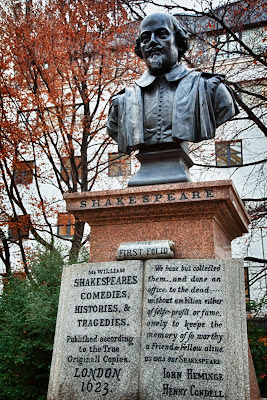 This bust of Shakespeare, is in the very pretty garden of St Mary Aldernabbury Gardens, behind Guildhall. A request from Jo. Mo, thank you so much. I can finally read it properly. "So worthy a friend" indeed. Isn't it a stroke of luck that they actually did this! You know, I've been looking for this!!! LOL. Everytime I go there I look for the bust. Come to find out I've always been in the wrong garden! I haven't seen this statue in many years! I'm also glad you are showing it to us. A nice reminder of what this fine writer contributed to the polishing of the English language. We seem incapable of producing such sparkling words in our time. I have to agree that I never read Shakespeare's works to the end. Well all I can say is thank goodness for John Heminge and Henry Condell! 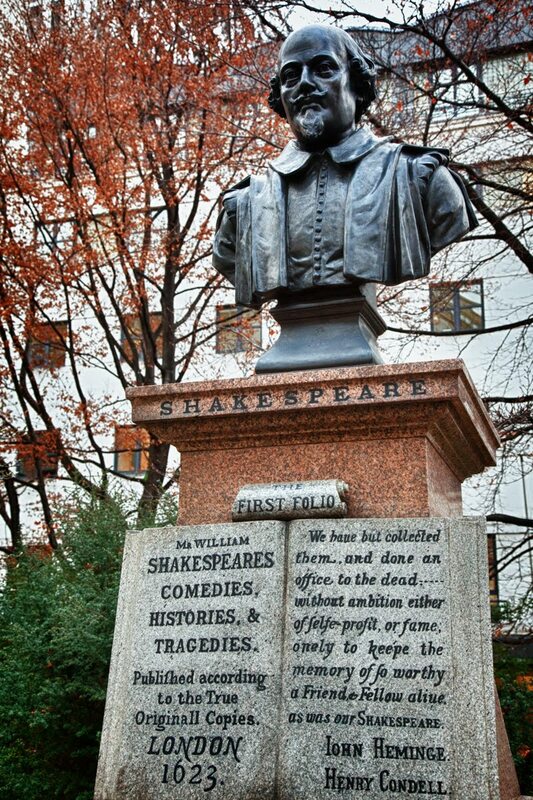 I love watching Shakespeares plays - one should always see them first, then read them. We are so much the richer for them! I wonder what he would think of todays 'texting'? u r awsum, mo!! I wonder if 'little Louis' (:-) realizes that Shakespeare coined something like 8000 (sic) new words and phrases, many of which we use today. That may make him praise Bill even more.